With RM300,000, the biggest prize ever in Malaysian eSports history in sight for the champions, you can surely bet it attracted the best and the top talents of Malaysia's HON players. Knowing that many would certainly fight it all out and flip a coin on their luck, organisers Garena has planned hard and long touring around Malaysia extensively to reach out and lure even more aspiring HON teams we have. Well if you have been following the global eSports scene, you can guess that HON naturally isn't doing quite well in the industry, and that may quite be the reason why Garena has forked out such a high cash pool to attract and 'convert' gamers from playing a certain MOBA (Multiplayer Online Battle Arena). But nevertheless it's wonderful for our aspiring national players who gathered at the hub of all Garena fanfare, the Garena Carnival. Also dubbed as the 'Battle of Titans', a total of 8 teams battled it all up on stage to gain the edge over the others. Some stood out, but some, had ultimately fallen. Among the teams, you can say Orange eSports have been the dominating force throughout the 3-day-long tournament, securing wins after wins and presenting a solid performance from day 1 to day 3, it would take a miracle to bring the formidable force down. I would at the same time say that MUFC had quite been the fan favourites for the game, but their usual standards were somehow lacking and though they manage to crawl out from the losers bracket, they ended up 3rd after succumbing to HON Portal. But nevertheless a huge congrats to the top 3 winners of Garena's HON championship! 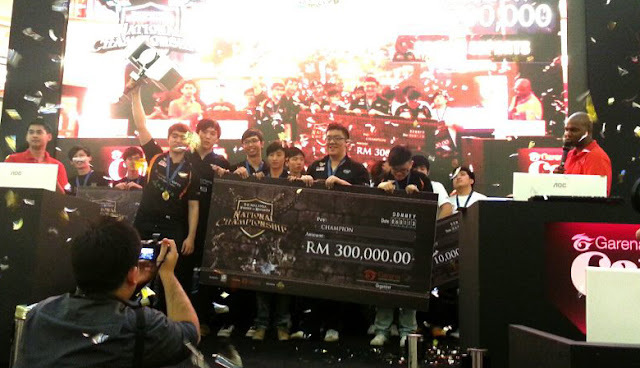 Malaysia's HON champions (RM300,000) - Orange eSports.